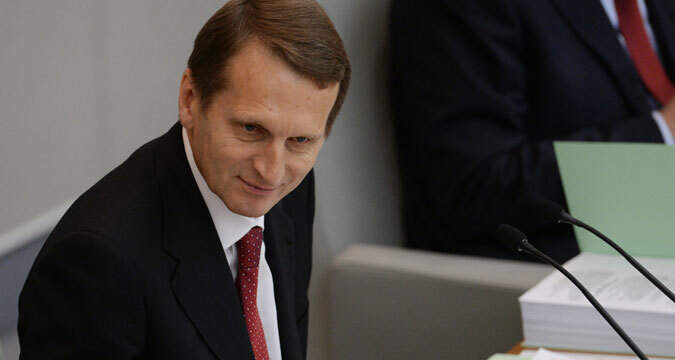 Russian State Duma Speaker Sergei Naryshkin. Sergei Naryshkin will also meet Japanese parliamentarians and businessmen. Russian State Duma Speaker Sergei Naryshkin will meet with Japanese Prime Minister Shinzo Abe in Tokyo on June 16. “Negotiations with Prime Minister of Japan Mr. Abe will be held in Tokyo this evening,” Naryshkin told reporters in Vladivostok prior to the start of his visit to Japan. A series of consultations and meetings with representatives of Japan's political and business elite and Japanese parliamentarians will take place on June 17, he said. “We will discuss opportunities for broadening inter-parliamentary cooperation, which plays a key role in creating the right and friendly atmosphere of interaction between our two countries and our peoples,” Naryshkin said. Naryshkin also said that he would attend the opening ceremony for an annual festival of Russian culture in Japan. It will be the 11th such event. “It is a major event, which confirms once again that it is possible and necessary to hold an effective dialogue between peoples through culture, and that it [culture] is a good instrument for international cooperation,” he said. “We are at quite a crucial stage of the development of Russian-Japanese relations. Despite the difficulties, we believe and realize the prospect for cooperation in the economy, politics and humanitarian issues. These will be the topics of our discussion tomorrow,” Naryshkin said.